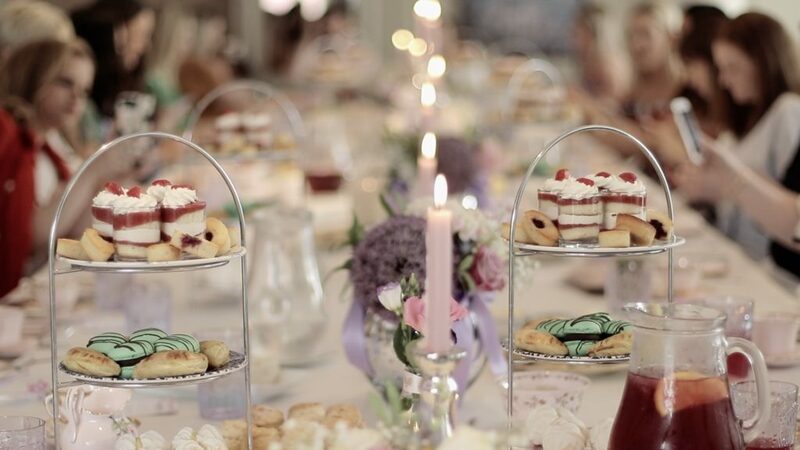 When the lovely Clara of Lucy & Belle phoned me one day out of the blue to chat about an idea she’d had to host a very special afternoon tea for bloggers in N Ireland I was delighted as everyone knows how much I love a project and especially one which involves pretty teacups, flowers and delicious food! 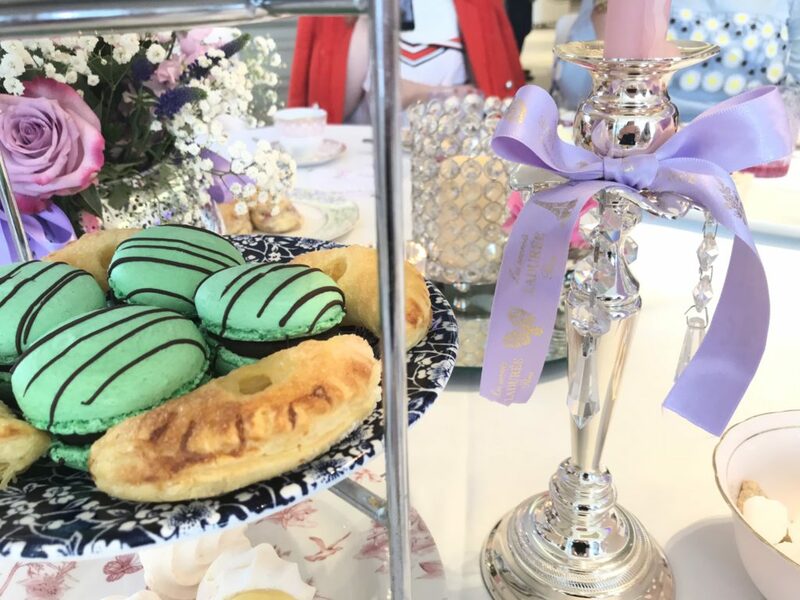 Clara truly is the most lovely person and very like myself when it comes to being particular about little details and making sure that everything is planned to perfection! 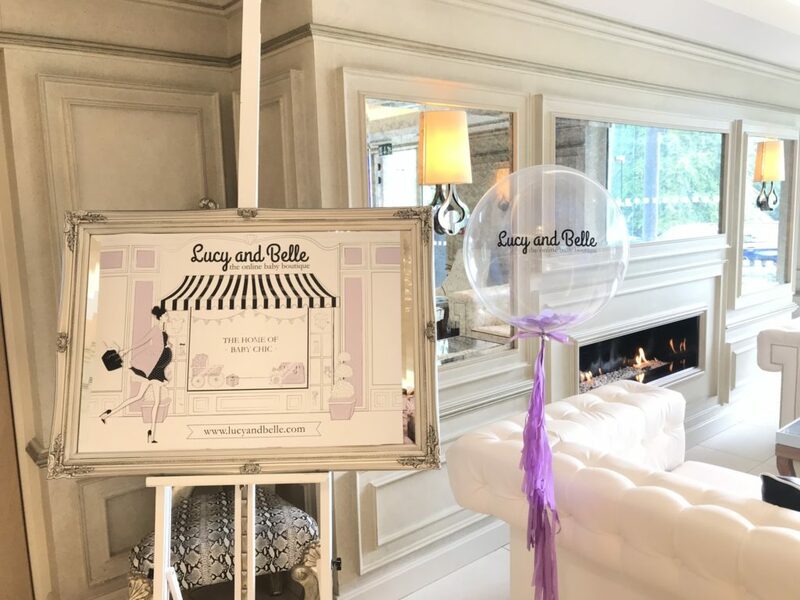 She has the most adorable little twin girls, Lucette & Annabelle, who were the inspiration behind her starting up Lucy & Belle and I have to say on the day of the afternoon tea they were definitely the stars of the show pushing their little pink pram around and charming everyone who met them! 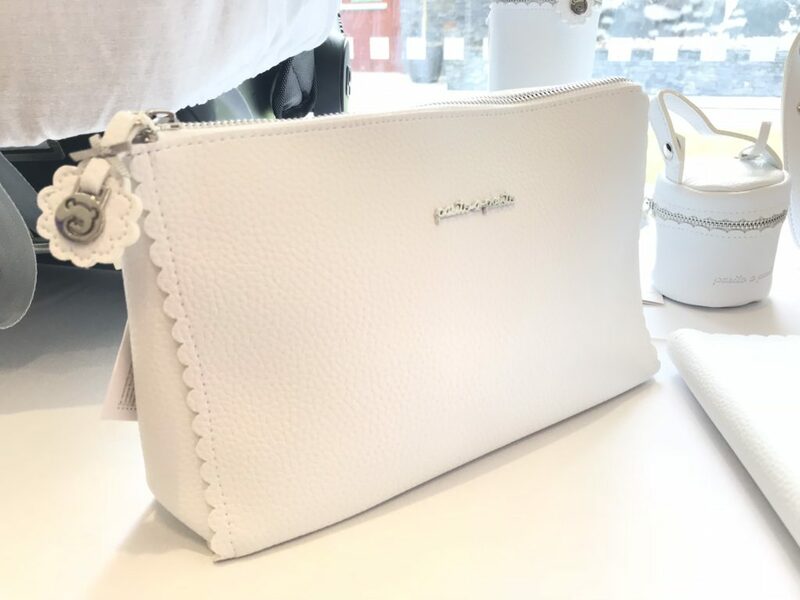 Lucy & Belle really is the most fabulous online baby boutique stocking designer brands from around the world including Pasito a Pasito, La Niña , Doudou et Compagnie, Kissy Kissy, Baby Gi Newborn and Livly. 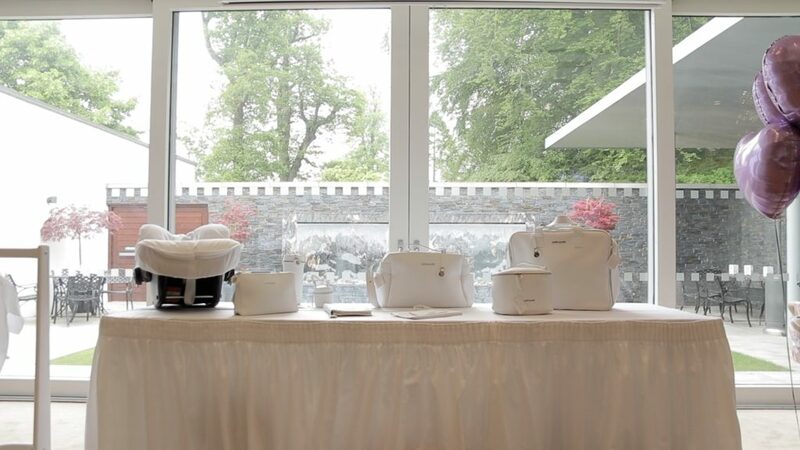 It’s definitely my place to go for the perfect baby gift as you are getting a top quality product combined with excellent service with a very personal touch and it was lovely to see the products up close and in detail at the event. 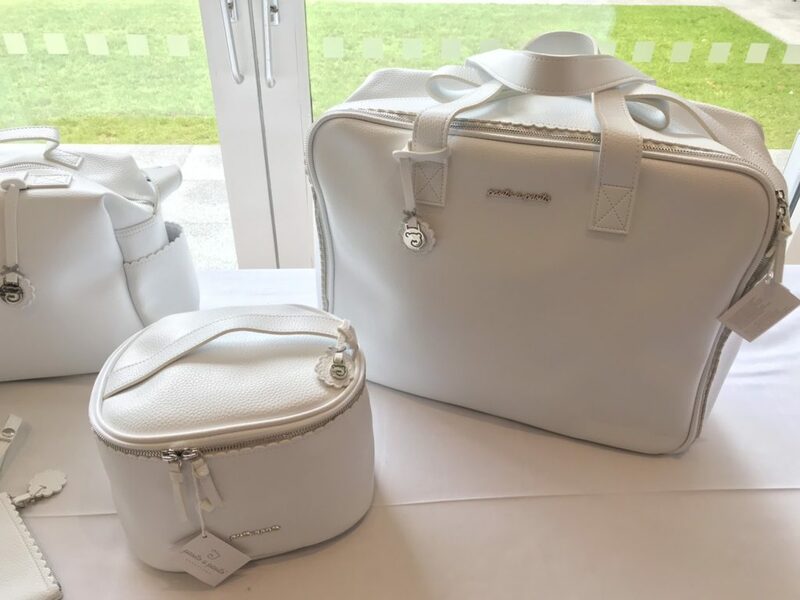 My daughter Rebecca got the pink Pasito a Pasito changing bag and accessories when Lydia was born and it not only looks beautiful but is still in perfect condition over two years later proving that they stand the test of time! 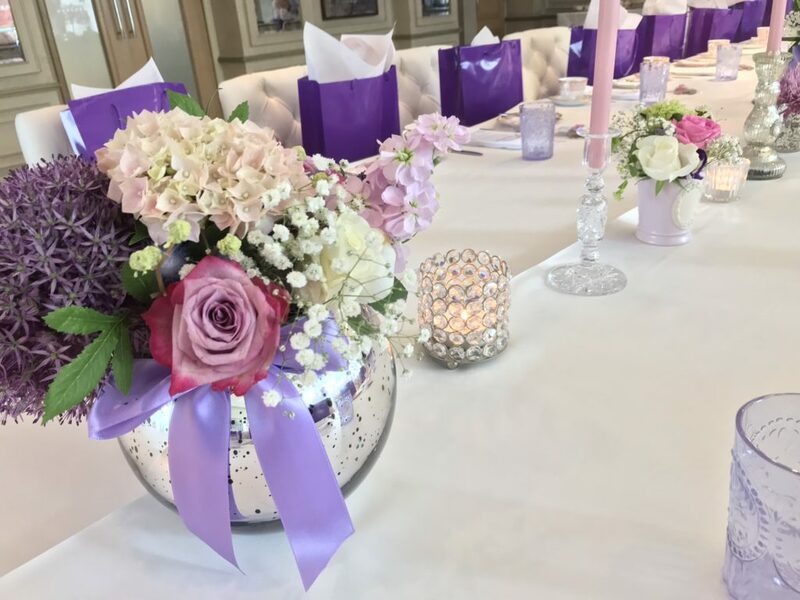 So now onto all those little details which made the day so extra special!! 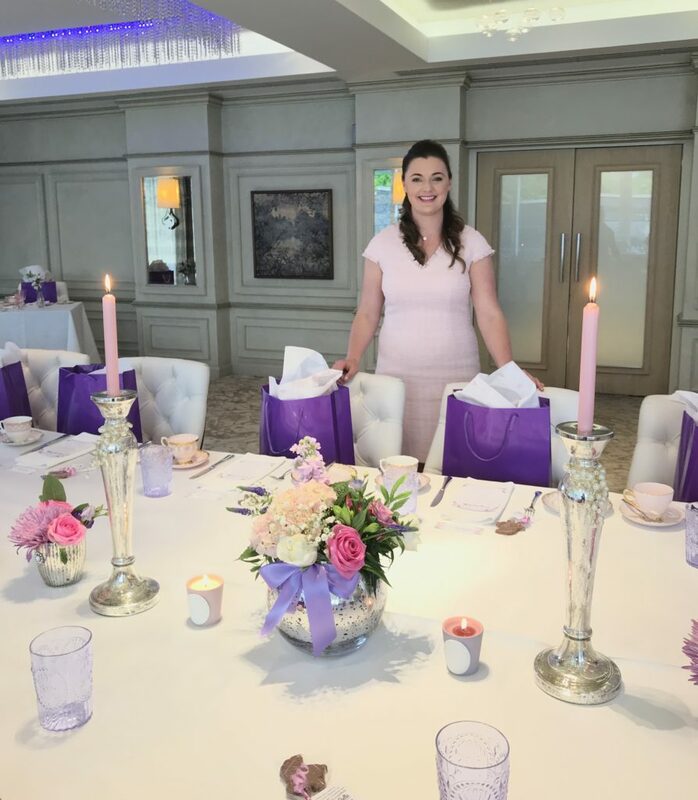 When choosing a venue I have to say that Galgorm Resort & Spa was at the top of my list as it’s just so beautiful and I sent Clara some pictures to see what she thought of the Four Seasons Suite which is perfect for the more intimate event. 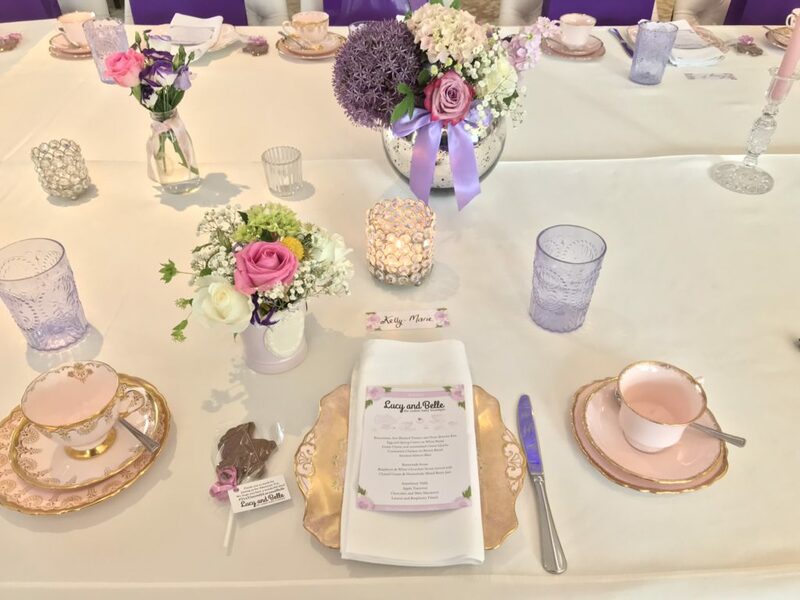 When she loved it as much as I did we decided not to look any further and began planning all those little details. 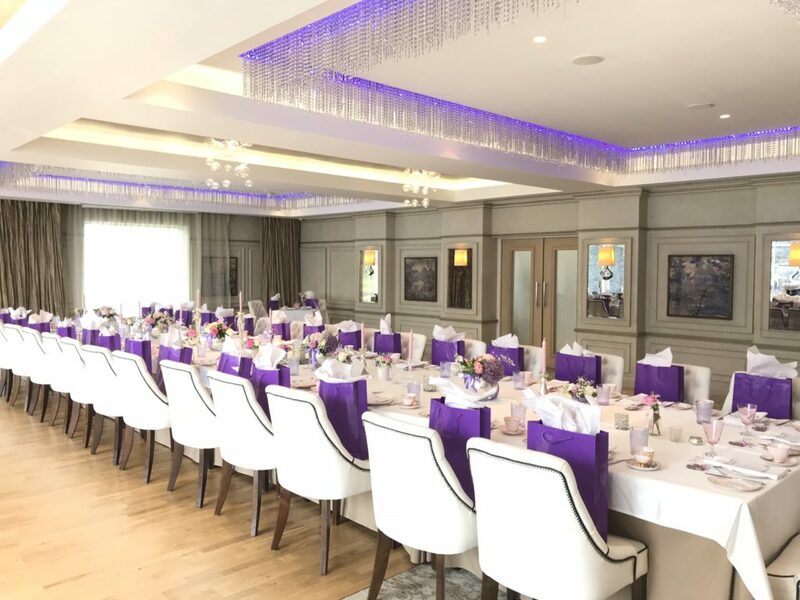 I’m a huge fan of boardroom style table settings as I feel they create much more of a wow factor with the decor running the full length of the table and Galgorm were happy to accomodate that rather than the usual smaller round tables. 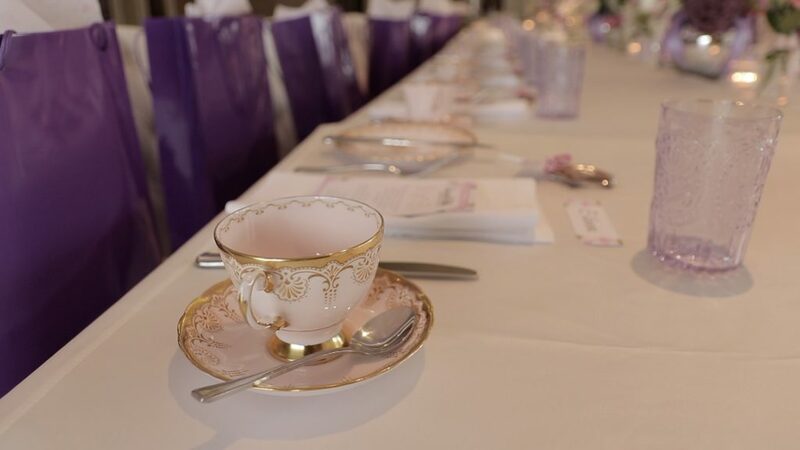 Of course it all depends on the number of guests whether or not this is possible but I knew for approximately 30 guests it would be the perfect set up and it meant that everyone sat together round the same table which makes for much more lively conversation and encourages people to get to know one another better! 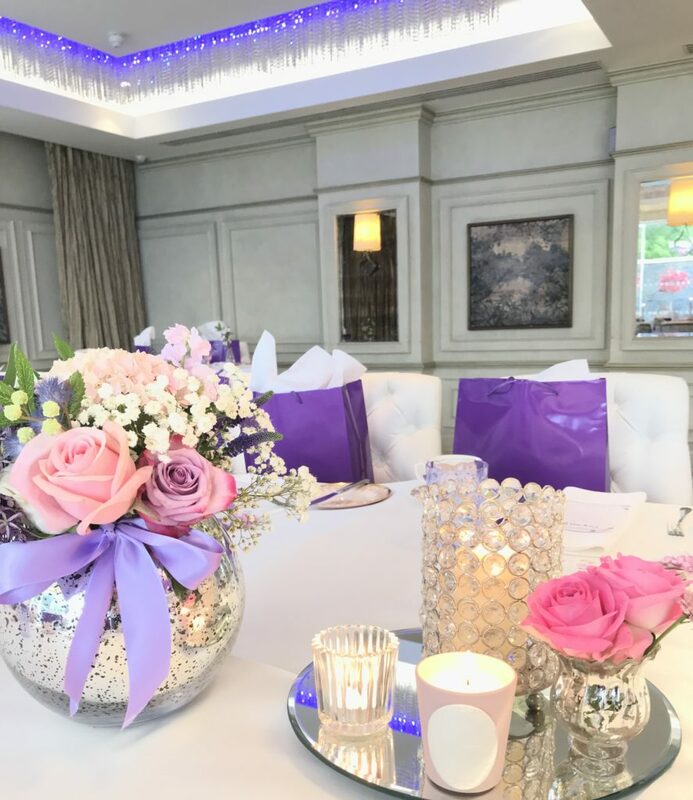 Guests were greeted on arrival with delicious mocktails served in the beautiful reception area of the Four Seasons Suite and it quickly became apparent by the amount of laughter and chatting going on that it was going to be a fabulous afternoon! 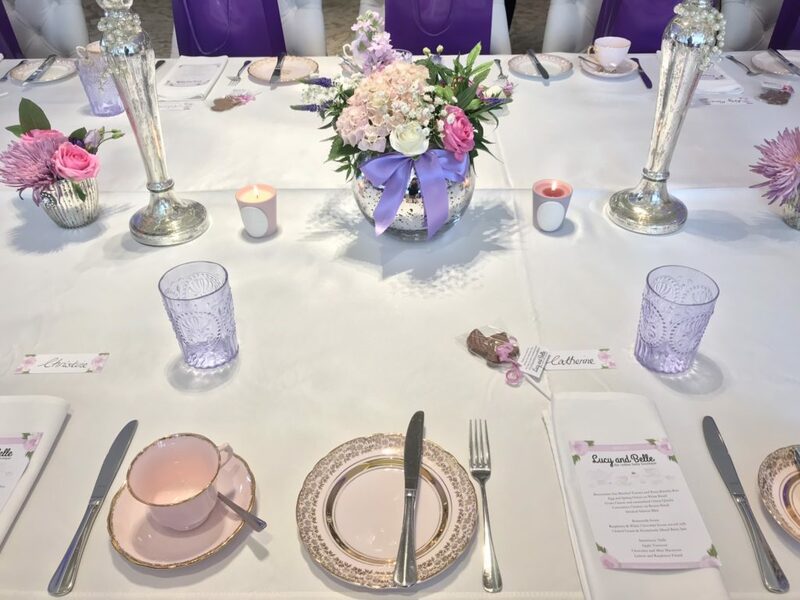 After all the guests had arrived and had a chance to mingle and chat whilst enjoying their drinks they were then called through to the dining room and got their first glimpse of the table which was set with pink vintage teacups and lilac fleur de lys glasses from Anthropologie to match the colours of the Lucy & Belle brand. 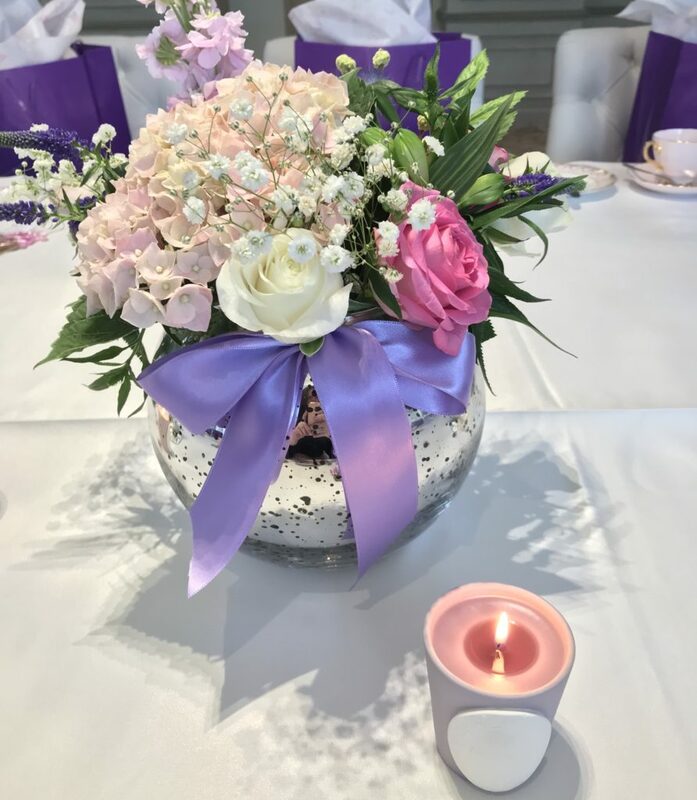 I decided to keep the table decor fairly contemporary in keeping with the style of the Four Seasons Suite but with lots of sparkle and colour. 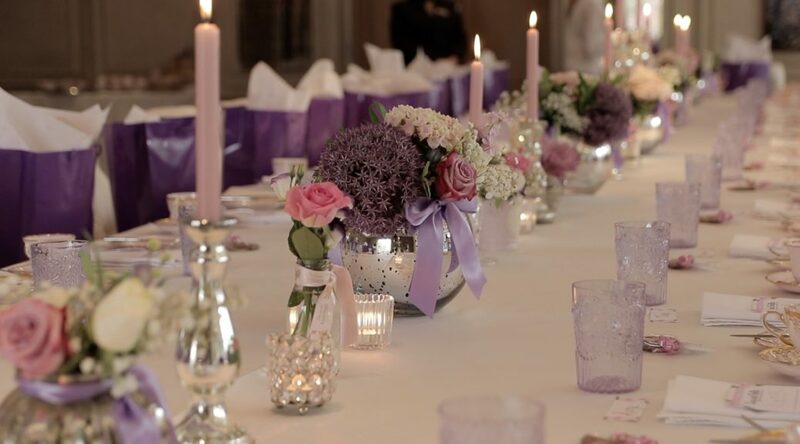 Mercury glass is hugely effective in a boardroom table setting and I filled mercury glass bowls with fresh flowers in pinks, lilacs & purples and used different sized mercury glass candlesticks with pink dinner candles as well as candle holders with lots of sparkly crystals to create that overall feel of glamour and sophistication. 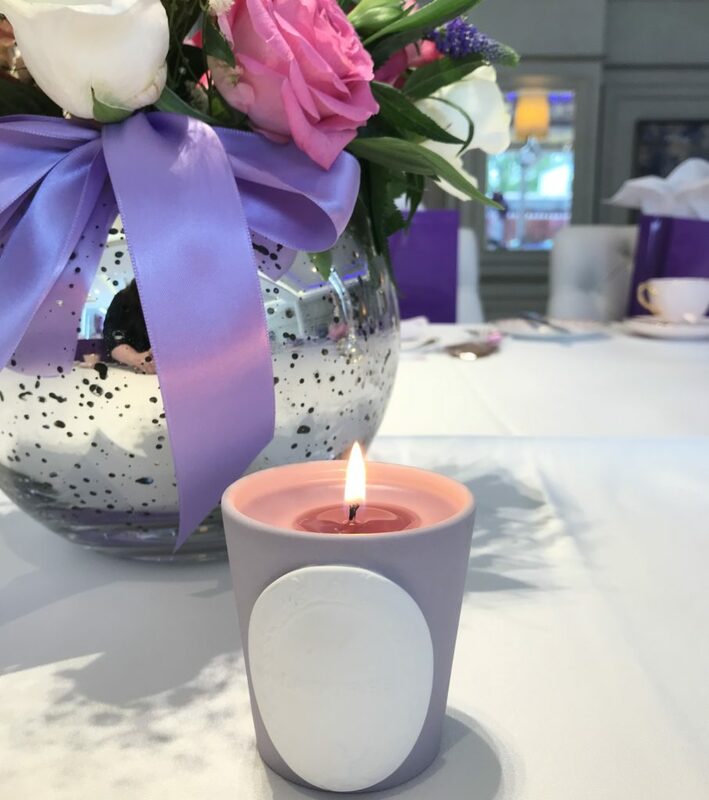 I also dotted in some beautiful Laduree candles and tied some lilac Laduree ribbon round some of the candlesticks to add a little bit of Parisian chic to the proceedings! 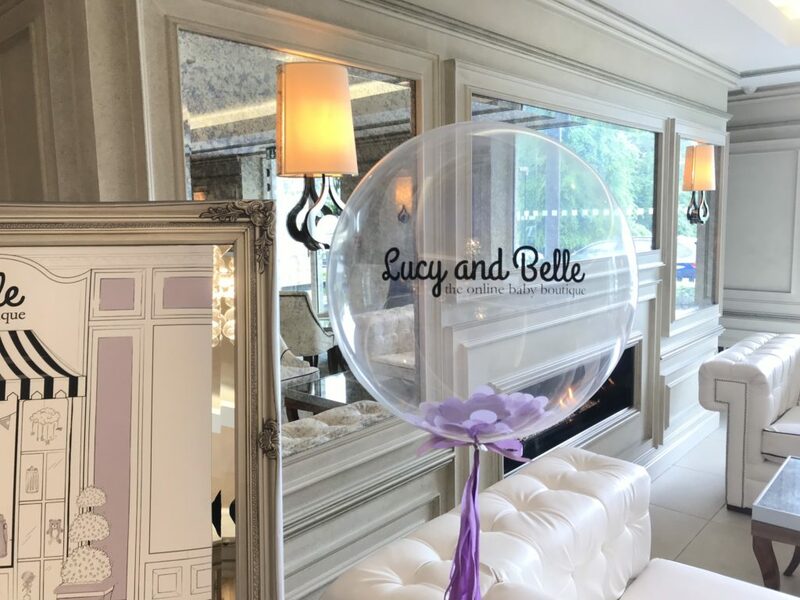 Clara had the most beautiful menus printed with the Lucy & Belle logo and there was one at each place setting as well as the cutest ever pram shaped Belgian chocolate lolly party favour! 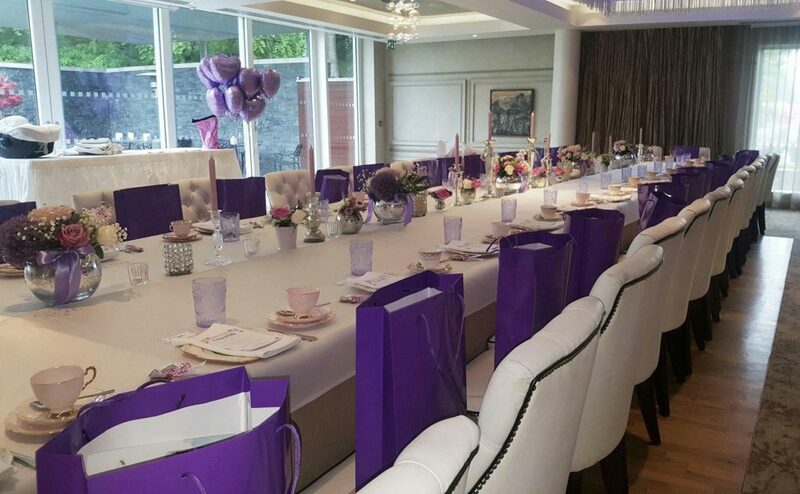 There was also the most fabulous gift bag for each guest packed with all sorts of delightful gifts! 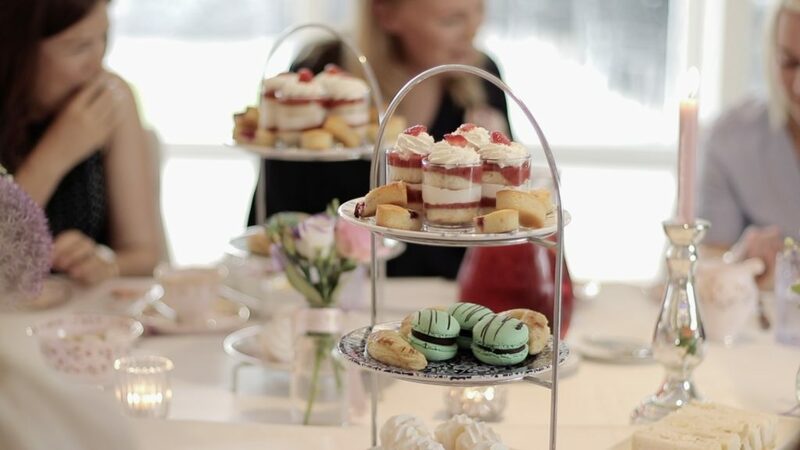 Clara had liaised with the chef to create the most perfect afternoon tea menu and every bite was utterly delicious and hugely enjoyed by all the guests. 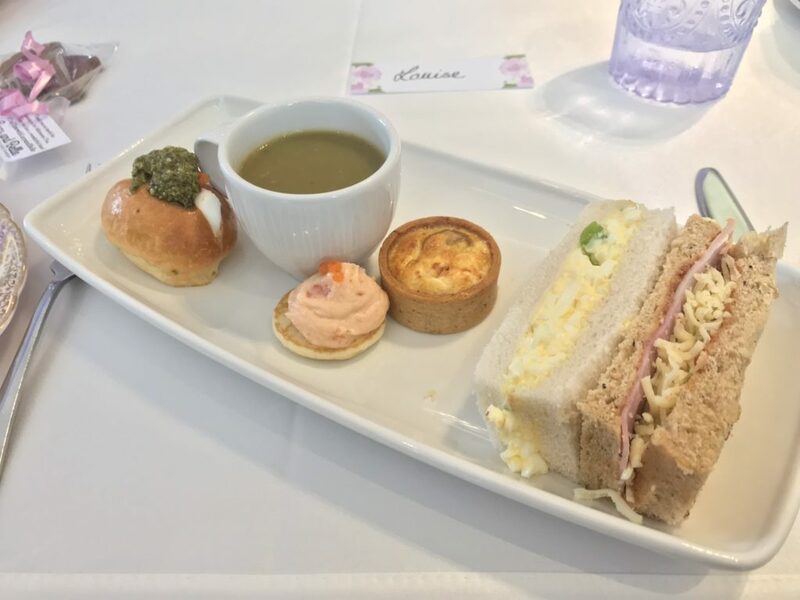 And of course we all had to take pics of the food before tucking in because if you don’t take a pic for Instagram did it even happen?! 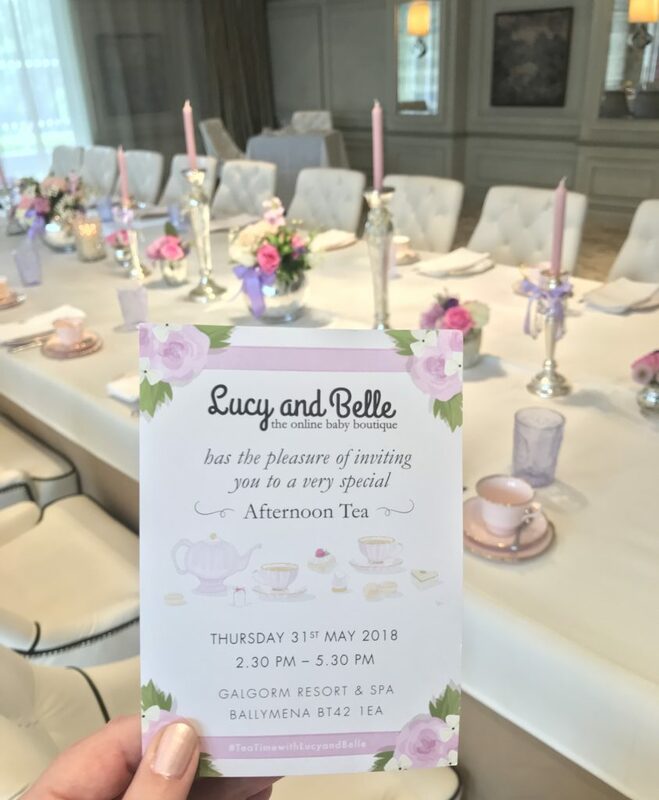 Clara spoke beautifully explaining how Lucy & Belle came about and how it’s very much a family affair and it was lovely to hear more about how it all started and the inspiration behind the business. 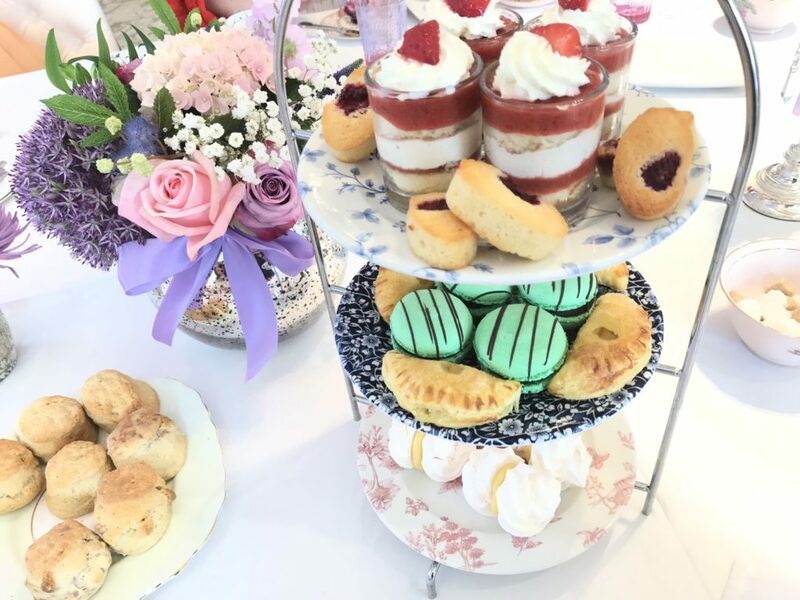 After we had enjoyed the delightful afternoon tea, guests then had a chance to see some of the products and everyone was super impressed by the quality and how lovely everything was. 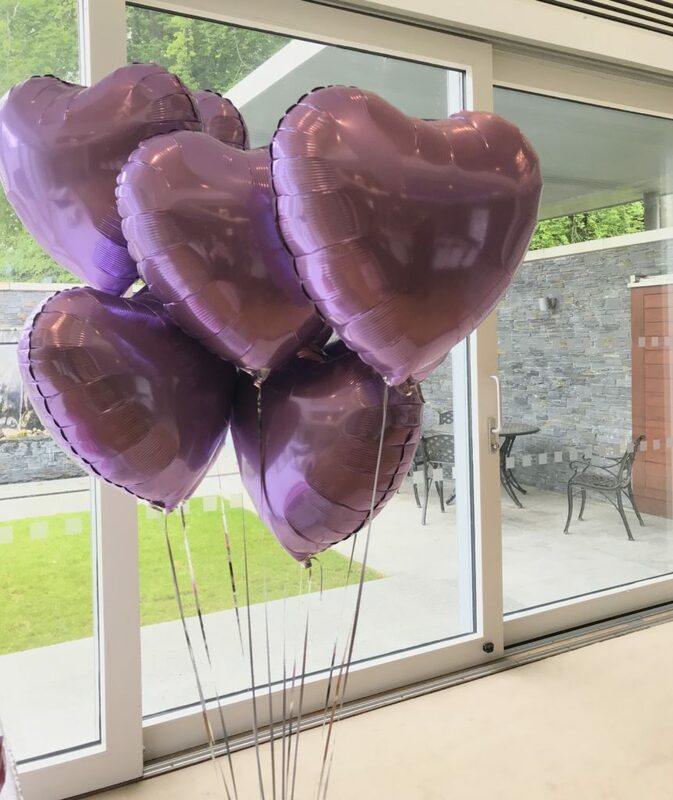 And in typical blogger style the pretty balloons were then taken outside in the sunshine for some fabulous pics in the gorgeous grounds at Galgorm where the flowers are all in full bloom at the minute and it was so lovely to see all the gorgeous pics popping up in my IG feed over the next few days! 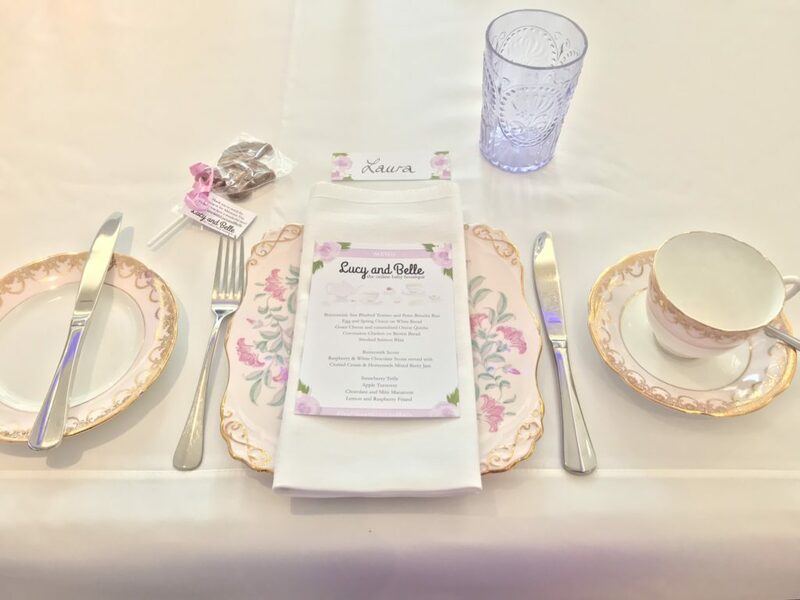 The event was filmed from start to finish by the talented Kathryn of Day & Age films and she captured the essence of the day to absolute perfection and it’s a perfect reminder of what a special day it was!